I’ll summarize each of the specials below. Garfield and Odie go trick-or-treating, dressed as pirates. However, things take a turn for the worse when they stumble upon a *real* haunted house. Garfield’s all geared up for Thanksgiving, at least until he’s put on a diet by Liz the vet, who Jon invites over for dinner. Making things worse is Jon’s inept meal preparations, which lead to the Arbuckle household requiring help to finish the meal on time. This special is enjoyable, but the weakest of the three holiday specials. Grandma Arbuckle’s appearance is enjoyable, as is Jon trying to explain to Liz the origins and traditions of the holiday. Interesting contrast to the current comic strips (and “The Garfield Show” TV series) where Jon and Liz are now a couple, though I don’t know if they’ve had a Thanksgiving storyline in the comics since pairing the two up. Jon, Odie, and a reluctant Garfield visit Jon’s parents, brother and grandmother on their farm for Christmas. 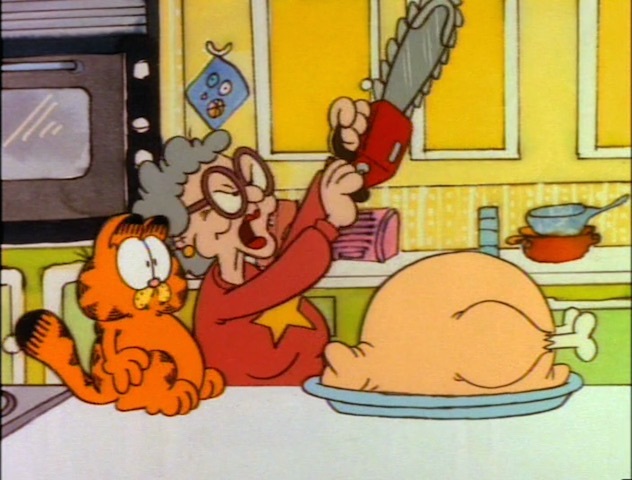 Lots of holiday-related moments with Jon’s family, including a Garfield-approved large Christmas Eve dinner, soon follow. There’s also the usual holiday sentimental aspects, particularly a subplot involving Jon’s grandmother, who still misses her (deceased) husband around Christmas. This was probably the most popular of the Garfield specials, airing every year in the late 80s and through the 90s, even after the other specials ceased airing regularly. I like seeing the interactions between Jon’s family members. Grandma’s response to her son noting how she’s “packing away the food” is particularly funny. I also like that the special avoids most of the usual cliches of Christmas specials. There’s no parodies of other Christmas stories (“A Christmas Carol,” “It’s a Wonderful Life,” etc. ), no focus (besides Odie’s efforts and Garfield’s funny dream-sequence) on present-shopping, no “Christmas is ruined” plot, etc. The special centers around Garfield, Odie, Jon, and Jon’s family of farmers preparing for and celebrating together the holiday, which makes this one stand stronger than yet another “Christmas Carol” variant/”<character> Saves Christmas” storyline. If I were bringing back older Christmas specials to air on broadcast TV again, this would be one of the first ones I’d consider (certainly over the likes of the “Shrek” Christmas special). Video and audio quality (mono sound) of the DVD is pretty good for the specials, given when they were produced (produced in between the mid-to-late 80s). This is a bare-bones DVD, as there’s no special features on this disc, not even trailers for the other Garfield DVDs available. Overall, if one’s a fan of Garfield or of these holiday specials (especially the Halloween and Christmas ones), this DVD is well worth the purchase. Previous Post:More on Kevin Keller’s miniseries, possibly similar fate to Cheryl Blossom?